unting and shooting apparel have changed dramatically in the past 10 years with the use of technical, performance fabrics and the integration of designs that give a nod to extreme athletic pursuits and military functionality. Kryptek Outdoor Group embodies this shift with its “battlefield to backcountry” products, which build on the personal experience of the company’s founders while hunting in the backcountry and serving our nation on the battlefields of Iraq and Afghanistan. This Tactical LS Zip and Tactical Pant are decked out in Raid, one of Kryptek’s extensively tested proprietary camouflage patterns. Kryptek’s founders, Butch Whiting and Josh Cleghorn, served together in the U.S. Army in Northern Iraq and bonded over their mutual passion for backcountry biggame hunting. While deployed, the two would dream about becoming part of the outdoors industry and getting to live that passion every day. 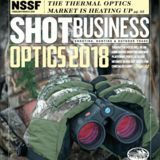 They knew from their personal experience in the military that the revolutions in tactical military apparel could convert to the outdoors market, and they were determined to give their vision a shot. The original Kryptek business plan focused on “spiraling the features and functions of specialoperations apparel into the civilian hunting market,” a concept that gave the company its first big break when Kryptek landed an exclusive retail agreement with Cabela’s. The original Kryptek product used the licensed Mossy Oak Mothwing Mountain Mimicry pattern on the tactical-born hunting apparel. This initial success opened the door to the industry from 2010 through 2012, but Whiting and Cleghorn still had to hold down other jobs outside the industry. Their vision was to design their own camo pattern and expand the company to the point that it would be their only job. The true game-changer came through a solicitation by the Department of Defense seeking a new camo pattern for the U.S. Army. Kryptek’s camo concept built on the hexagon pattern of camo netting—one of the most effective types of camouflage to blur silhouettes—and used micro and macro layering to transfer the 3-D effect of the netting to a 2-D flat surface. Kryptek was one of only 24 patterns that met the DOD’s requirements to be entered into the U.S. Army Phase I testing. This comprehensive test process measured retinal response to see how long it would take for soldiers to visually acquire a target wearing the different camo patterns in a variety of background terrain. 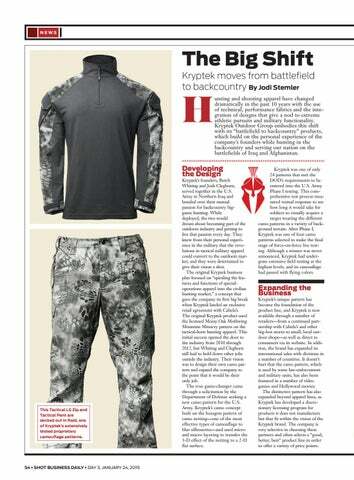 After Phase I, Kryptek was one of four camo patterns selected to make the final stage of force-on-force live testing. Although a winner was never announced, Kryptek had undergone extensive field testing at the highest levels, and its camouflage had passed with flying colors. Kryptek’s unique pattern has become the foundation of the product line, and Kryptek is now available through a number of retailers—from a continued partnership with Cabela’s and other big-box stores to small, local outdoor shops—as well as direct to consumers via its website. In addition, the brand has expanded its international sales with divisions in a number of countries. It doesn’t hurt that the camo pattern, which is used by some law-enforcement and military units, has also been featured in a number of video games and Hollywood movies. The distinctive pattern has also expanded beyond apparel lines, as Kryptek has developed a discretionary licensing program for products it does not manufacture but that fit within the vision of the Kryptek brand. The company is very selective in choosing these partners and often selects a “good, better, best” product line in order to offer a variety of price points.